Mercury mini LED sospensione is a pendant light by Italian manufacturer Artemide which combines extravagant design with high energy-efficiency. 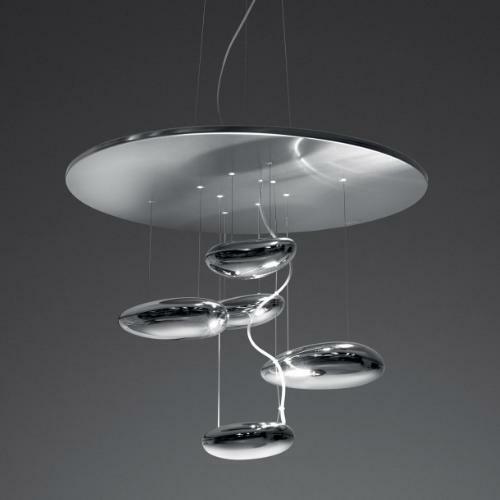 Created by Ross Lovegrove in 2012, the luminaire is composed of a stainless steel reflector and "drops" which are pending on it. Because of the drop-like shape, the LED-light is absorbed and reflected in a special, fascinating way and the emerging combination of light and shadow will draw you in. The LED technology provides a bright, warm-white light which is highly energy-efficient. This makes the Mercury mini LED sospensione pendant light by Artemide not only a beauty, but also a functional and modern luminaire. Since 2017 Artemide offers Mercury Mini Sospensione LED also in a variant with a light temperature of 2700 Kelvin, which results in a particularly warm and atmospheric room light.